The Resurrection of Jesus: Hoax or Historical Fact? Christians around the world will be celebrating the resurrection of Jesus, western churches on this Sunday. And, indeed, the resurrection of Jesus is the key doctrine of the Christian Faith upon which all depends. Jesus Himself foretold His own death and resurrection numerous times, saying, “Behold, we are going up to Jerusalem, and the Son of Man will be betrayed to the chief priests and to the scribes; and they will condemn Him to death, and deliver Him to the Gentiles to mock and to scourge and to crucify. And the third day He will rise again” (Matt. 20:18-19). He also said, “Because I live, you will live also” (John 14:19). Thus, if Jesus did not rise bodily from the dead on the third day, He can be considered nothing but a liar, and Christianity is a hoax! What hope could any have of everlasting life if Jesus Himself did not rise from the dead on the third day? If Jesus did not rise from the dead, as some — even within the outward pale of churches — have said, Christianity is an empty and worthless religion. It is as St. Paul writes to the church in Corinth, “And if Christ is not risen, your faith is futile; you are still in your sins! Then also those who have fallen asleep in Christ have perished. If in this life only we have hope in Christ, we are of all men the most pitiable” (1 Cor. 15:17-19). But, in spite of the skepticism of some, there is solid evidence for the resurrection of Jesus. Not only was the resurrection of the Messiah prophesied in the Old Testament Scriptures, but it is also attested to by the New Testament apostles and evangelists with claims of seeing, touching and talking to the risen Christ Jesus. Matthew, Mark, Luke, John, Paul, Peter, James, Jude and the writer of Hebrews all attest to the resurrection of Jesus. Not only did Jesus appear alive to Mary Magdalene and the other women, but He also appeared to Peter, to the two disciples on the road to Emmaus, to the eleven on numerous occasions, to James, to the Apostle Paul on the road to Damascus, and to more than 500 believers at one time. At the time when Paul wrote to the Corinthian church, most of these eyewitnesses were still alive and could be questioned by any who had doubts — Paul invited them to do so (1 Cor. 15). Now, nearly two thousand years removed, some have said that Jesus did not actually die but swooned on the cross and later revived in the tomb — a foolish hypothesis since the Roman soldiers were well experienced with death, and especially with death by crucifixion since they regularly crucified both criminals and rebels. Crucifixion victims had to lift themselves up on the cross to breathe. Hanging motionlessly meant breathing also stopped and life ended. The spear thrust into Jesus’ side left no doubt. Jesus indeed died upon the cross (John 19:32-34)! And, even if it was somehow possible for one to be crucified and not yet be dead after hanging motionless, ceasing breathing and having a spear thrust into his side, would laying in a tomb, wrapped in burial cloths and receiving no medical attention enable one to survive scourging, crucifixion and a spear wound to the chest? Certainly not! Some have said — indeed, right from the beginning (Matt. 28:11ff.) — that Jesus’ disciples came and stole the body and moved it to another tomb where it probably still lies to this day. This too makes no sense at all and doesn’t explain His resurrection appearances. It’s entirely unlikely that followers of Jesus who fled when Jesus was arrested and then hid behind locked doors would risk death at the hands of the Roman soldiers who guarded the tomb in order to steal a dead body and advance a fake religion. And, while people may risk all and suffer death for something they mistakenly believe to be true, would all of Jesus’ apostles willingly face death and persecution for something they knew was a lie? Again, it’s not likely! Not only did Jesus’ disciples suffer persecution and agonizing deaths; they gave up the comforts and pleasures of this life as well. They had nothing to gain by preaching the resurrection of Jesus if indeed He did not rise. And what of those who spread the stories of Jesus’ body being stolen away? They could easily have put a stop to the spread of Christianity if they simply produced the body of Jesus. But did they? No! There is no record of any attempt or claim to produce the body of Jesus. Why? Because the tomb was empty and even the enemies of Christianity could not refute the resurrection of Jesus! 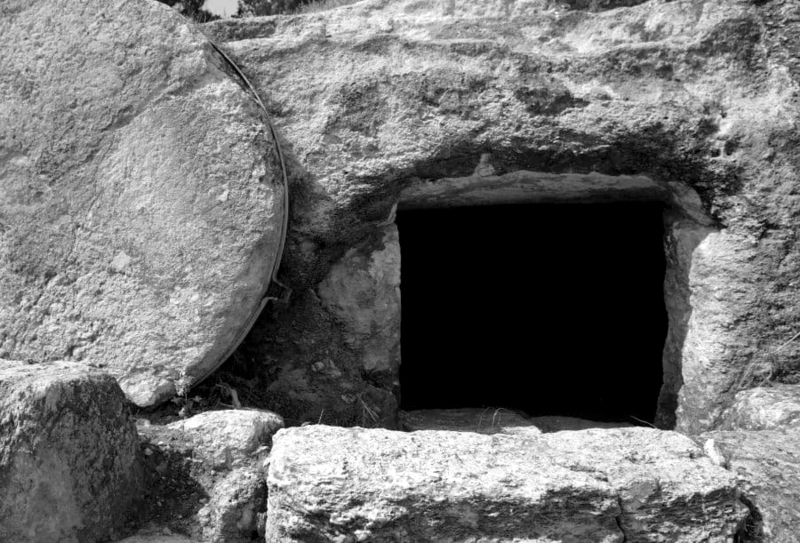 So, what does the resurrection of Jesus mean for us today? Well, it proves that Jesus is who He claimed to be, God the Son and the Messiah and Savior of the world! It proves that His teaching is true. His resurrection proves that He did indeed take the punishment for the sins of the world that we might have pardon and peace through faith in Him. His resurrection proves that those who fall asleep in Him — those who die trusting in Him for the forgiveness of sins and life everlasting — will be raised up on the Last Day to the eternal joys of heaven just as He promised! And, of course, it also proves that he will return to judge the living and the dead, as He has said, and that those who have not relied upon Him for forgiveness and life will be condemned to everlasting punishment in the eternal fires of hell. The only real hoax in regard to Jesus’ resurrection is the argument that he did not rise. It’s a hoax advanced to destroy the faith of those who trust in Jesus for forgiveness and life everlasting. It’s a hoax advanced by those who do not wish to accept the testimony of eyewitnesses who both saw Jesus crucified and then alive again on the third day and the subsequent 40 days. It’s a hoax advanced by those who do not wish to one day be accountable to the risen and glorified Jesus. The resurrection of Jesus is a historical event which affects every human being in this world. Those who consider it and place their hope in Jesus and His resurrection shall receive, as Jesus says, the forgiveness of sins He won for all by His sufferings and death upon the cross, and life everlasting because He rose from the dead and is “the Resurrection and the Life” (John 11:25). But those who neglect or spurn it face a most miserable eternity with no hope, no blessing and no joy!